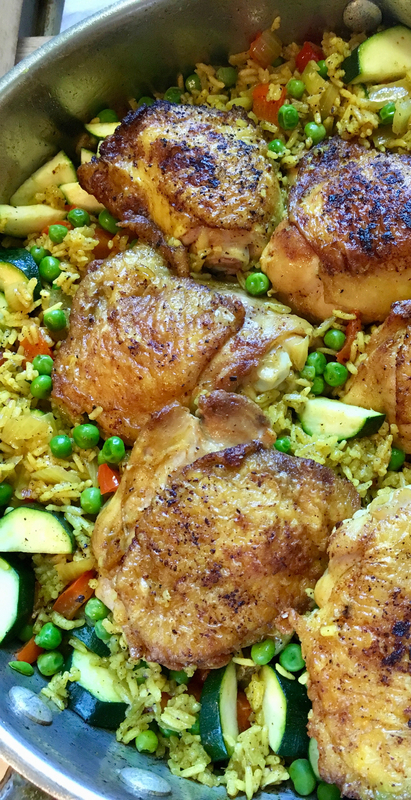 For most of us who always have hectic days, I think we can all appreciate an easy one-skillet meal like this turmeric chicken and rice. It’s definitely one of my go-to meals because it’s easy on the budget and not hard to make. What I also love about it is you can add vegetables like peas, zucchini or cauliflower florets. Turmeric belongs to the ginger family and its roots are used as a spice. Because of its brilliant yellow color, it is known as the golden spice. Inspired by the classic curry dishes, I thought turmeric seems like a good spice alternative. I didn’t know much about turmeric before, so I was pleasantly surprised. Honestly, it’s not really too spicy or hot at all. It seems like the flavor is a cross between ginger and pepper. Additionally, it gives the dish a nice bright yellow color. So I’m glad I tried it and now it’s a keeper. 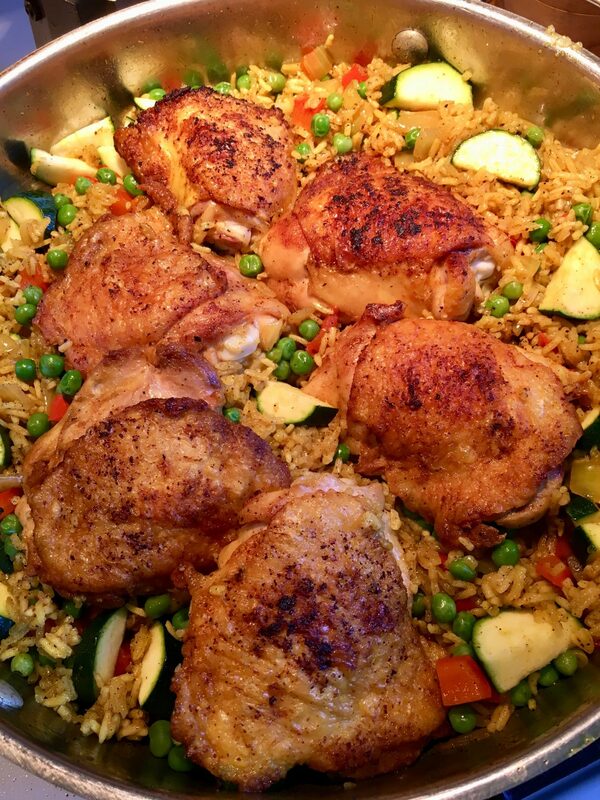 As for the chicken thighs, rubbing the mixture all over it gives that extra flavor. When you brown the chicken, it smells so good! Wash rice and let it drain in a strainer. Cut zucchini in half lengthwise and chop it to 1/4 inch thick. Set aside. 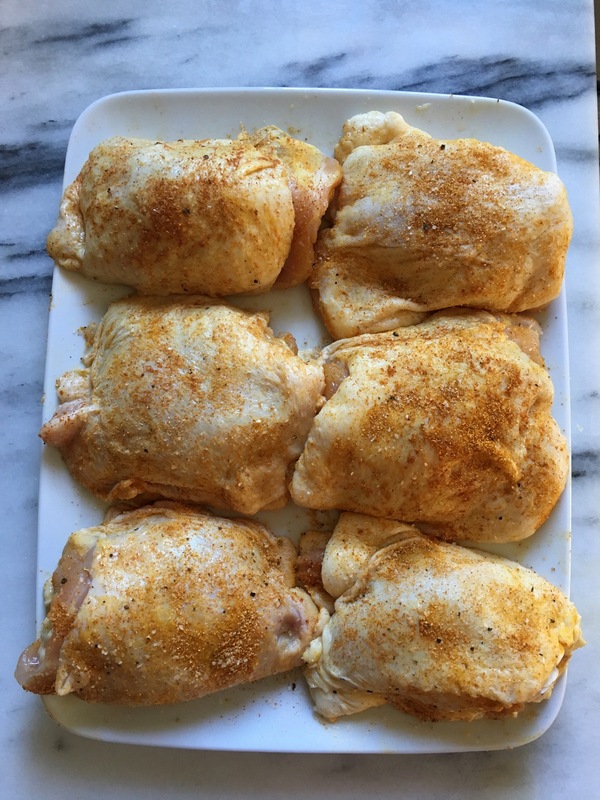 Wash chicken thighs and dry it with paper towels. Mix 1 tsp turmeric, 1 tsp garlic power, 1/2 tsp cumin, 1/2 tsp paprika, 1/2 tsp salt, 1/4 tsp freshly ground pepper in a small bowl. Rub spice mixture all over chicken thighs and set side. Heat olive oil in a large skillet on medium/high heat. 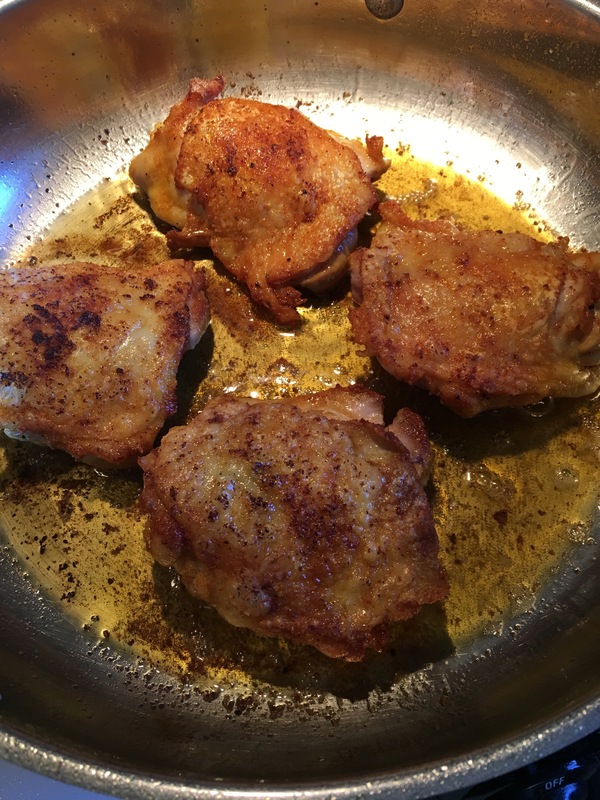 Brown chicken thighs in hot oil for 4 mins. each side. Transfer chicken onto a plate and set aside. Take out some of the oil except 1 Tbsp. Turn down heat to medium. Saute zucchini and 1/3 of the garlic for 2-3 minutes. Transfer zucchini onto a plate and set aside, leaving oil in the skillet. Add the onion, red bell pepper and the rest of the garlic and sauté for 2 mins. Stir in rice, 3/4 tsp salt, 1/4 tsp freshly ground pepper and chicken stock. Turn heat to medium/high. Add in chicken thighs. Cover the skillet and let it come to boil. Once it boils, turn heat to medium/low and simmer for about 25 minutes, until the rice is cooked and has absorbed the liquid. At the last 5 mins. add the peas and zucchini. Cover it and continue cooking for another 5 minutes. Cauliflower florets can be substituted for the zucchini. Cut the florets in small bite-sized pieces.